I hate to say it, but even though I enjoyed it, it was so very predictable. I really liked Becca, most of the time she seemed much smarter than the usual teenage heroines I meet. Being clumsy and not able to direct yourself in space is human nature (and hers as well). She does seem to have a teenage propensity for quick falling in love (not that Alex was far behind). I don’t count this as a spoiler as it’s rather obvious from both the blurb and the beginning of the book. But it would be a spoiler to let you know what they discover once they get to St. Brigid’s and the story starts unraveling. I will say that the characters are well portrayed and you understand why they act the way they do, there is a mention of the great smell of libraries (something I definitely notice) and tension at some points will make you try and read faster. 17-year-old Becca spent her whole life protecting her brother from, well, everything. The abandonment of their father, the so called ‘experts’ who insist that voices in his head are unnatural and must be dealt with, and the constant threat of being taken away to some hospital and studied like an animal. When two representatives appear claiming to have the answers to Ryland’s perceived problem, Becca doesn’t buy it for one second. That is until they seem to know things about Ryland and about Becca and Ryland’s family, that forces Becca to concede that there may be more to these people than meets the eye. Though still highly skeptical, Becca agrees to do what’s best for Ryland. What they find at St. Brigid’s is a world beyond their imagination. 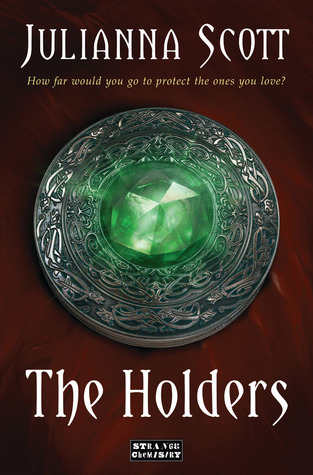 Little by little they piece together the information of their family’s heritage, their estranged Father, and the legend of the Holder race that decrees Ryland is the one they’ve been waiting for. However, they are all–especially Becca–in for a surprise that will change what they thought they knew about themselves and their kind. She meets Alex, a Holder who is fiercely loyal to their race, and for some reason, Becca and Ryland. There’s an attraction between Becca and Alex that can’t be denied, but her true nature seems destined to keep them apart. However, certain destinies may not be as clear cut as everyone has always believed them to be. Becca is lost, but found at the same time. Can she bring herself to leave Ryland now that he’s settled and can clearly see his future? Will she be able to put the the feelings she has for Alex aside and head back to the US? And can Becca and Ryland ever forgive their father for what he’s done?